I haven’t really been craving anything banana-ey lately, and so I put off making anything with the pile of super brown bananas lying in my fruit bowl. Then on Friday my friend Nadia brought me some brown bananas she’d had lying around, and, not wanting to chuck the lot, Sunday night I decided to just get on with it, use the damn bananas. I feel kind of bad saying it, I mean I LOVE bananas, and most any kind of baked good with them in it, but the past weeks I’ve just been daydreaming about fudgy brownies and cinnamon rolls. But, in my kitchen, no banana is left behind. I first made Luna Månebarn’s vegan banana bread in November of last year, and have been making it again and again and again ever since. It’s so good, and so quick to make, better than most non-vegan banana breads out there. Then a little while back, she posted a recipe for blueberry muffins with bananas and poppy seeds, and I printed it out and put it in my ‘to try’ pile. It’s a ‘mix everything together in one bowl’ kind of recipe, which takes about 10 minutes, tops, to mix together and distribute into your muffin pan, probably less time than it takes to heat up your oven, which is my most favourite kind of recipe. Especially when it’s 10 pm on a Sunday, and I have a bunch of brown bananas looking at me with sad, reproachful eyes. And these muffins – oh man. They’re kind of surprising, I wouldn’t normally think to pair bananas and poppy seeds! 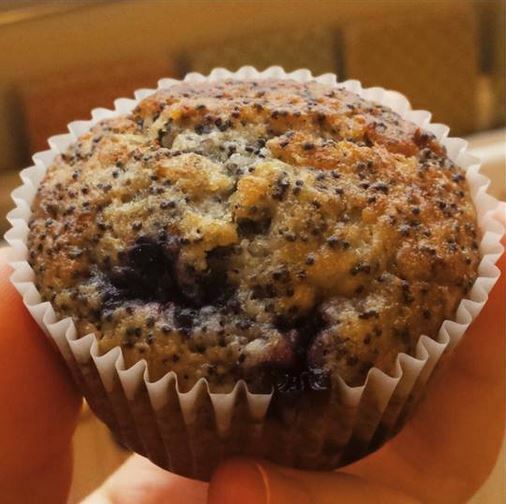 But these are so light and moist, sweet with just the right amount of salty, and the delicate sweetness and satisfying crunch of the poppy seeds and bursts of tangy blueberries that offset the sweetness… I’ve already eaten six. I whipped them up in less than 30 minutes, start to finish. They are just lovely and kind of delicately wholesome, and at times almost taste like they have chocolate in them (maybe the combination of poppy seeds and super ripe bananas does that?! I don’t know, but some bites taste almost chocolatey to me). I made a double portion to use up more bananas, the recipe doubles super easily. I might add 50 g more blueberries next time, I like my blueberry muffins heavy on the blueberry! Other than that, to me at least, these are kind of perfect. Preheat your oven to 200°C/400°F. Line a muffin tin. In a large bowl, mix together the flour, sugar, poppy seeds, salt and baking soda. Mush your bananas, then add these, along with the oil and the vinegar (or lemon juice) to the dry ingredients. Stir everything together well, but don’t over-stir – just until you’re sure there are no streaks of flour. Toss the blueberries in the tbsp of flour, then quickly and gently fold these into the batter. Scoop into your muffin liners, then bake for 20 minutes, until the muffins are nice and golden. Let them cool in the pan. Eat one as soon as you can 🙂 they keep well for several days at room temperature. I’m sure they also freeze well (the banana-nut ones do), but I will test this and report back!